An experienced professional can save you time and money on your tax preparation. When it comes to filling out long, complicated tax forms, there are a lot of places where you could make a mistake. When you trust THE HOLLIMAN GROUP, you'll have peace of mind knowing that one of your mistakes won't come back to haunt you. We strive to provide reliable service in Mobile, Alabama. Tax compliance is not just a seasonal business. Our firm handles tax-related work throughout the year and offers personalized customer service relative to your compliance or planning needs. Our goal is to provide the best professional services available. We can address your concerns and answer all of your tax questions, and we offer free review of the prior year's tax returns. We are experienced with working with the IRS on behalf of our clients. 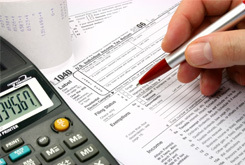 The fees for tax preparation may even be deductible on your income tax return.